TAP 34 is a self design of Terta company from Hungary. Primarily it was designed as a terminal for big computer systems but it was also able to process data alone. The main integrated circuits were assembled in the USSR and in Hungary by Tungsram, but several parts were imported from other countries. The built-in monitor was a DME-28 monochrome CRT made by Orion. This company was famous for its televisions in Hungary and the other KGST countries. 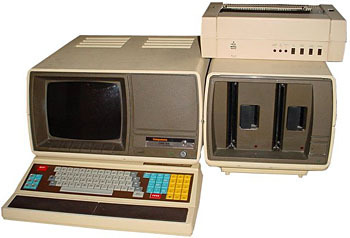 The floppy drive attached to the computer was regular 8 inch 77 track drive using IBM format. This drive, which could use single and double sided disks, was a hungarian product also, made by the MOM. The first design had some communications software in the EPROM, but at the end of the 80's the computer was redesigned. This second design had only 2 kBytes of EPROM, containing the bootloader software for the CP/M. The CPU card, the Ram card, the CRT card and the floppy controller card were all placed into a coloured plastic case. The system was designed around the classic 8080 circuits. TAP-34 had the number EC-8534 in the EC-serries (united serries of computers) of East block and ex-USSR. Abbrevation "TAP" states for Teletype Abonents Point. There were three known modifications of EC-8534: original one, EC-8534.02, and EC-8534.3. The last one had optional capability to boot CP/M clone called VDOS. The standard software included some built-in teletype programs and BASIC (Terta-BASIC). There was also a so called DP (Developer Package) floppy bootable system for assembly development (included editor, assembler and debugger). see more Terta TAP-34 Ebay auctions !